RS4 only 263whp flat from 6k rpm ?!?! Thread: RS4 only 263whp flat from 6k rpm ?!?! Carbon Buildup caused the below! This is a serious problem, but easily checked. 1. Drive so you can get into second gear. 2. Put your foot flat, and feel the car pull. 3. If you don't have a second burst of power around 6k, and the car revs quicker, you have a problem. The engine is now being stripped by Audi to find the ongoing cause of the carbon buildup and retarded timing. Firstly, Hello everyone. I'm been reading these Forums since January this year and it's a great source of information. My name is Mal, and I'm from Sydney Australia. I've owned my RS4 Cab since January. It's a great car, and even more special here given Australia only received 26! Anyway, here is my problem. My RS4 only produces 263whp from about 6k and stays flat to 8k. It's very odd and something is obviously wrong. Can anyone provide any suggestions about what may be the problem. 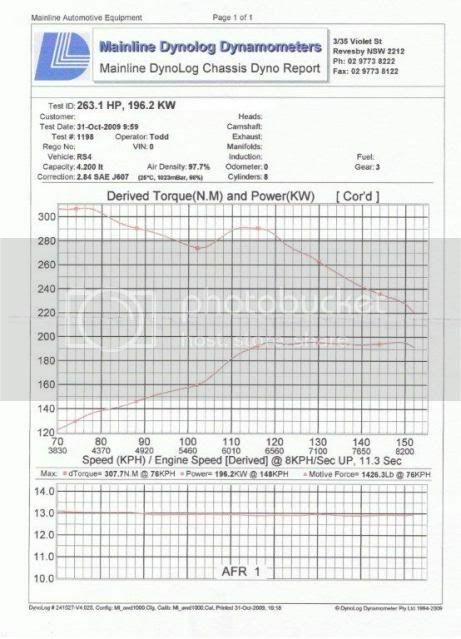 See RS4 Dyno Graph below. 1. Car seems to ping at random (but always used High Octane (98 in Aus = 93 in US). It doesn't only happen on high load, it can happen at any time. Re: RS4 only 263whp flat from 6k rpm ?!?! umm, why doesn't the torque line cross the power line? edit: nm. THE METRIC SYSTEM BROSEPH! Last edited by justinperkins; 11-03-2009 at 11:03 PM. I was thinking the same thing... Power and torque always cross at 5,252 rpm. Always. ...I remember stalking one I saw at the Mall, damn how expensive things get once you leave the US. it goes without saying that something is very wrong if you are flat from 6k to redline. could very well be a dyno error. how does the car feel from 6k to redline on the street? If you've been on here since January, you've seen all the commons problems with the RS4, have you checked your car for those issues? Regarding the graph, I agree, you normally see the torque line cross, but this is normally just a scale thing with the plot. You'll notice on my graph torque falls away about 6k, consistant with the power flat line. Driving it is the same. It makes all it's power by 6k and seems flat from there. Also, the Dyno was done on the same day as about 40 other cars (A4 2.0T's, VW R32's GTI's, a Ferrari, RS6 and an old Porsche (1970's putting out about 330awhp!!)). All the cars ran well with nice "normal" graphs. My mate, and European Car Mechanic, seems to think the computer is limiting power for some reason. What could cause this? All dynos read differently. I don't think I have ever heard of the dyno they used for your car but there could easily be an error in how they set it up or its just a REALLY low reading dyno. Yep, agree 100% and if I was the only one there I would have taken it to someone else for a second opinion. Just to clarify guys, it's not the peak power I'm concerned about, it's the flat line between 6-8k rpm. PS: My brothers 2006 A4 2.0T with REVO Stage 1 put down 178awhp (which seemed about right). Hmm that does look very odd. Not sure what to think about it. How does the car "feel" to you while driving? I would try another run on a different dyno if you can just to double check. Torque graph crossing the power graph at 5250 or whatever rpm only happens when you use us measuring system lb-ft and hp I guess. Check your timing mate... Stock should be in the range of 30 degrees btdc. As per the two other graphs posted, yep, agree 100% there, and that's what I'd expect to see (from curve point of view, not worried about peak power at this stage). The other odd thing is, as the power flattens you'd think you'd feel it, like ESP coming on and reducing power, but it's smooth, and drives well. I suspect it's been this way from day 1, or it's a gradual thing and I thought I'd just been getting used to the power. Wow look into the timing for sure. that is not right even if you are on poo gas. JHM war machine. Total transformation. JHM/Tune/headers/intake manifold. Oh yuh it's ridiculous. I went to go price out my current car when I was living in Australia...with all my current options it was over 100K once converted back to USD. Needless to say I moved back before I bought the car. On the plus side though, you guys do get cooler cars like RS4 avants and the C6 RS6! kilowatts cross Newton meters at 9550 rpm, right? so have you checked for carbon? also on some of the older audi's there were some issues with catalytic converters clogging up i heard.. was this ever true? a friend of mine had a b5 A4 and the car had lost tons of power.. turned out the cats clogged with soot and carbon. I'm going to check carbon build up ASAP. You posted over on Audiworld that you had detonation too. Flat power and detonation seems like an exhaust restriction to me, I would look for failed catalytic convertors causing exhaust flow restriction myself. Yep, that's right. It's the strangest thing. I use Premium Fuel (98 RON = to 93 in the US). Every now and then the car will ping. It's at random. Sometimes I've heard it just as the clutch comes out during a slow take off, other times cruising at 60k's and gently pressing the go pedal. It happens for a split second and then stops (I assume that when the timing is pulled back). Now that I think about it, I had a similar loss of power a while back (no dyno proof). It ended up being the rear exhaust flap vacuum tubes that were unplugged causing a leak in the vacuum system. It was as if the power would flatline at around 5-6K where I used to feel a surge of power. After the hoses were plugged, problem instantly solved! Just one other thing to check you know.. I highly doubt this is possible. There aren't too many borescopes I know of that can be inserted into the throttle body and snake all the way down to the intake valves (it would have to get past the manifold flaps also). Maybe he could stick a 90-degree head ino the combustion chamber and hope the intake valves are open in that cylinder. The only thing is "most" borescopes won't provide enough light to actually see what's on the vlaves. Fuel quality, Octane, ambient temps are all key players. Yep, car is stock and the vacuum hoses are blocked 100% (a screw and 2 clamps). This is confirmed as the Intake Manifold Valves are moving as expected. It seems to be pinging more now (more often). I know it's predetonation, so now I'm worried it's eating the top of the piston away. Is this possible if I'm hearing it for a split second every 3rd/4th time I need to accelerate? Is it possible the MAF is not reading correctly? Check the plugs yet? Pull them out and check for anything out of the ordinary. Maybe your car has a faulty coil on plug (COP) creating misfires. Do you have any check engine lights or codes? I'd think any type of sensor malfunction, vacuum leak, or misfire would pop a code. I'd definitely do this, also might as well put in a compression tester and check cylinder compression while you're at it for peace of mind. Good idea. While you are pulling the plugs it would be easy to run a compression test. Compression testers are cheap at any autoparts store and the test is pretty straight forward. Make sure you do it on the engine after it has been warmed up though. The numbers aren't valid when it's cold. Make sure ALL the COP units are disconnected, pop a plug out, screw the tester into the plug hole, gas pedal to the floor (shuts fuel off), crank for a 5-10 seconds, and record the reading. Do this for each cylinder. Google compression test for more info. Yup. I think the testers are about $25-30. I pulled the fuel pump fuse (in addition to all ECM fuses). I also removed all plugs, but I'm not sure that is necessary. Make sure you use the correct threaded (14mm on my B6) end and not an extended end. Hand tighten the tester. Its nice to have someone watch the gauge while you crank the engine with the starter, usually 6-8 cranks will be enough. Stop when the pressure plateaus and avoid cranking more than 12 times so you don't risk over-heating the starter. Record value, release pressure, remove tester and you're done. I own a RS4Cab as well and parted US$ 272 grand for this beauty in Singapore! ok, I'll get the plugs checked. The car has about 40,000km (25,000 miles). The car runs smooth, even at the top end where power is reduced. The RS4 was in the dealer today for a bunch of tests (Injectors, Coil Packs, Fuel Pressure, Mixture, etc). Unfortunately this all come up good. The tech is very thorough and quite helpful. It'll be back in next week for spark plugs and compression test. Not surprisingly, Audi was not interested in the dyno graph, but they do want to do an approved/recognised acceleration test. It's something like 1st gear 20kph-60kph in x seconds, 2nd gear 40kph-90kph in x and 3rd 60kph-120kph. Does anyone know more about this test, and what the numbers are? Audi Australia recognised that there is a performance problem. They have replaced the spark plugs and added a fuel octane booster. They asked that I drive it for another 1000kms and report back. After 120km the pinging is bad, very bad. It sounds like an old diesel. I'll give it a couple of tanks, but I really can't see this fixing itself. Any and all comments appreciated.